The 8 Bottle Thermoelectric Wine Cooler is an easy and convenient way to store and cool your wine bottles. 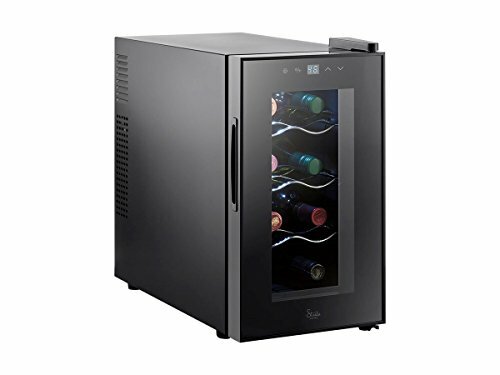 The temperature can be easily adjusted using the touch screen control panel and internal LED lights make it easy to find the right bottle of wine. Thermoelectric cooling technology ensures long life and quiet cooling, making it perfect for any room in your home. Interior LEDs: LED lights illuminate the interior of the cooler to make it easy to find the right bottle of wine. Elegant Design: The attractive, dark surface finish and chrome interior shelving makes the cooler an elegant compliment to your wine collection in any room of your home. Easy-to-Use Controls: The touch screen controls make it quick and easy to navigate the cooler's settings and adjust the temperature. Thermoelectric Power: Because it uses thermoelectric refrigeration, the cooler does not require a compressor, which reduces noise and increases the lifespan. What is thermoelectric cooling? : Rather than using a noisy compressor or environmentally unfriendly chlorofluorocarbons, a thermoelectric cooler passes an electric current across two dissimilar conductors, which draws heat from the inside to an external heat sink, where it dissipates into the ambient environment. Thermoelectric coolers work best when the ambient temperature is between 50~80°F.